Your credit card must be valid at the time of booking. In the case of apartments, villas and suites, at the moment of your arrival we will make a voucher as guarantee for some unforeseen, for which we will ask for a credit or debit card. Upon delivery of your accommodation we will make an inventory (items, household items, etc. ), the guarantee will be returned on the day of your departure after revising the inventory of the accommodation. Children under 3 years old do not pay, sharing room in existing beds with adults. All rates are in US dollars plus 13% tax. Rates are subject to change without notice. All reservations require a non-refundable advance payment of 50% of the total amount of the reservation, without this payment the reservation can’t be guaranteed. This payment will be charged to the credit card indicated by the customer at the time of booking. For reservations in Easter, Christmas and New Year season, the payment in advance will be 100% of the total amount, non-refundable. This payment will be charged to the credit card indicated by the customer at the time of booking. Reception hours: 07:00 to 20:00 hours. Check-in time: 14:00 to 20:00 hours. Check-out time: 07:00 to 11:00 hours. All cancellations and modifications must be made in the booking engine of the website and subject to the policies, penalties and cancellation deadlines established for each season, promotion, package or reserved room type. 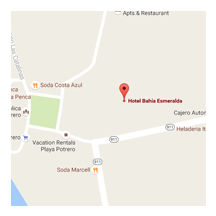 The present document establishes the basic guidelines for the good coexistence in the Hotel "Bahía Esmeralda"
1. Hotel Bahía Esmeralda is a place for rest and families, for this reason it is forbidden to scandalize, disturb and not respect the rest of the other guests, by ignoring this, the guest renounces his contract of stay and can be evacuated in any moment, the hour of silence is from 22:00 to 6:00 hours. 2. The check-in time is from 14:00 to 20:00 hours, and the time for check-out of the room is from 07:00 to 11:00 hours every day. If a guest stays longer it will be charged one more day of stay, having a maximum tolerance of 60 minutes for this purpose. 3. Every guest upon check-in must cover the total amount of the lodging. The administration will issue an invoice for the services rendered and the amount covered by them, when the guest requests it. 4. The hotel assumes no liability for damage, deterioration or damage to the property of guests inside the accommodation or vehicles stored in the parking lot of the establishment. 5. The Bahía Esmeralda Hotel does not have safe deposit boxes and will not be responsible for any valuables of the guests leave in the room, who must be responsible for their belongings. 6. The hotel is not responsible for objects or values ​​forgotten or misplaced on the rooms or in the facilities. The objects or values ​​forgotten by a guest in the room, will remain in custody of the administration of the hotel for a term of 60 days, after this period and when there is no claim, will be discarded. 7. Extra people are not allowed, with a maximum occupancy (including children over 3 years old) in: Double rooms 2 persons, Quadruple rooms 4 persons, Apartments 4 persons, Villas 6 persons, Suites 9 persons. 8. The hotel reserves the right of admission. 9. Guests from outside the hotel are not allowed in any accommodation or facility, with no exceptions. 10. Guests are not allowed to take out of their rooms and the establishment any equipment with which the room is equipped: towels, sheets, glasses, etc. 11. Any damage or loss caused by the guest to the property, must be paid in accordance with the value established by the administration. 12. In case the guest leaves the hotel (check-out) before the date of departure or is asked to leave for non-compliance with these Regulations, no refund will be made for the remaining unoccupied nights. 13. For safety reasons (fires) grills are not permitted inside or outside the accommodation. 14. No large sound equipment is allowed on the hotel premises. 15. Only 1 small pet is allowed per accommodation, exclusively in apartments, villas or suites, subject to our pet policy. Pets are prohibited in the case of resident guests (1 or more months). 16. The Bahía Esmeralda Hotel is declared smoke-free, that is why smoking is prohibited in rooms and common areas. 17. Resident guests are also subject to this regulation, in addition to the terms of the long stay agreement. 18. The guest will be responsible for reading and accepting other regulations that may be found in the hotel such as the pool, pool table, etc. These will be duly marked or can be consulted publicly at the hotel reception. 19. By virtue of having signed the registration card, the guests declare to accept in all their parts the present "Internal Lodging Regulations"
- Only dogs of small size (max 10 kg.) are allowed at this hotel. - The dog can’t circulate loose by the hotel facilities. - It is forbidden to leave the dog alone in the room, can only stay in the premises under the supervision of the owners, who are responsible for their behavior. - Under no circumstances our staff is authorized to clean the needy of the pet. - For sanitary reasons it is not allowed the use of common areas as an area to meet their needs. - The owner must be responsible for any damage caused by his pet, inside the accommodation or in the hotel facilities. - Pets are not allowed in the pool area. - Failure to comply with these rules may cause evacuation of the guests and the mascot of our facilities without any economic reimbursement.